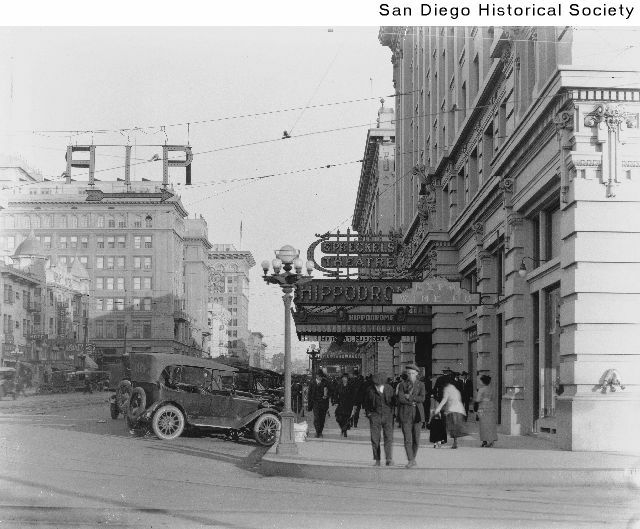 The Spreckels Theatre was opened in August 1912, designed by architect Harrison Albright in elegant Art Nouveau/Neo-Classical style, in the heart of downtown San Diego. It was managed by Dodge & Hayward in its early years for live stage shows and vaudeville acts. Its proscenium arch was huge, and clearly inspired by Louis Sullivan. The auditorium contained a balcony and six sets of opera boxes. A vast stage could hold the largest productions of the day, including its first show, "Ben Hur", which used live horses during the chariot race scene. Originally, there were 1,915 seats, to honor the year of the Pan-Pacific Exposition, held in San Diego. Since then, it has been reduced to 1,464. Above the proscenium is a spectacular mural of Apollo in his chariot surrounded by the muses. The lobby walls are covered in Carrera marble and sculptures of maidens, and the floor is done in mosaic style. Murals cover the areas above the lobby doorways, depicting scenes from the city’s history. In 1922, the Spreckels Theatre switched from Broadway shows to movies, and continued to be a first-run house into the 1970’s, when it was renovated, and returned to live performances. This stunning theater continues to present everything from touring Broadway productions, to rock concerts to dance and is one of the finest venues in San Diego remaining from the golden age of cinema. A grand old theater, laden with tons of class. Ironically, I never saw a movie here. In early February, 2002, I treated my daughter to Canadian singer Nelly Furtado’s concert and introduced her to Nelly and the band members after the show. My daughter also liked the fact that the tickets I had were in Row 4, floor level, but there really isn’t a poor seat in the house. I was a manager here for awhile in 1975, we ran movies and ocasionally a concert. It not only had a balcony but a gallery above that…and it was a steep slope …I would not want to trip on and go rolling down. There is a story that Ben Hur was done live there in the old days and they actually ran chariots from the side stage doors and on out…. it had a very large lift mechanism in the basement that could lift part of the stage up…for example to change a set or the orchestra…it is one large theatre….The theatre is a building inside another building so to speak..It has three walls of offices surrounding it that actually could be demolished leaving the entire theatre intact. Love this place. Saw Travis in concert here and I will never forget it. Back in the 1950s my Dad knew the head projectionist for this theater and arranged for a tour. It was quite a place, there wer 4 or 5 levels of seating and a large stage behind the screen. One thing I remember was a large representation of a baseball field, say 15 or 20 feet on a side, equipped with electic lights so as the indicate the path of the ball and base runners. This was used in the 1930s during the world series. Apparently people paid to sit and watch while someone operated the lights and an announcer called the action, based on information received via wire. After the tour, we got to see The Bridge on the River Kwai. In the early years of the Mainly Mozart Festival, I remember going to hear the Beethoven Triple-Concerto played in the Spreckels. What a lovely experience that was, too. Also, in the mid-1980’s, when AIDS was first coming to prominence, I as a young singer took part in the only concert the San DIego Opera Chorus has ever given, which was in support of AIDS research. It was a splendid evening, thanks in no small part, to the lovely ambiance provided by the Spreckels THeater itself. The neon blade-sign and marquee have recently been completely restored. It’s a sight to behold on Broadway after dark! 1952 photo added courtesy of the AmeriCar The Beautiful Facebook page.